Today, I finally finished this dress! Tracing out the pattern for it was the first sewing related thing I did this year but it took me three months to actually finish it. Normally, I sew pretty quickly but this time, I kept being held up by other things, other sewing and the need to find the right fabric. And in the end, I think it is for the best that I had some time to let the toile “marinade” on the sewing room table. The dress was way too sack-shaped initially and I think the solution I came up with in the end is much better than anything I considered back in January. This was the pattern. A wedding dress from Gracieuse magazine nr. 16 from 1929 (this magazine was published twice a month). I shortened the skirt so it would not be a wedding dress. This was the toile. Very, very baggy. In the end, I adjusted it by simply taking out 10 cm at center front. 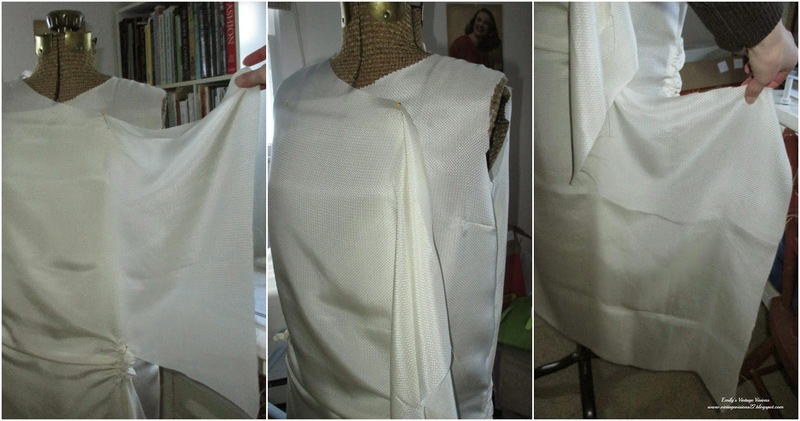 This meant sacrificing the cowl-neck (one of the features for which I chose the dress) but fixing all the other issues. 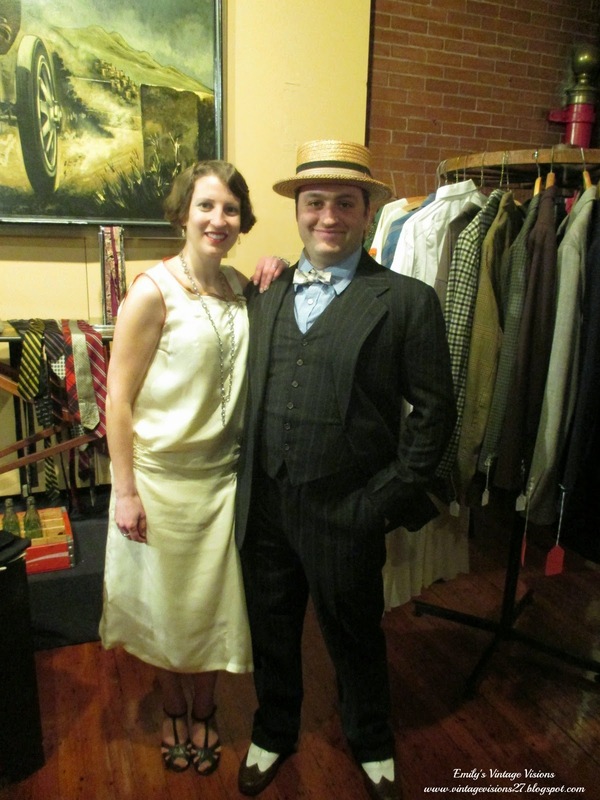 When I made a hat to go with my 1950’s suit, I got interested in making other styles of hats as well. Hats can be tricky for me. Not all styles work with long hair and a fringe. But I really liked the idea of making a 1920’s style cloche and fortunately, I had some patterns in my 1920’s Gracieuse magazines. This is the design I picked but I didn’t add the scarf. The pattern looks like this. Different from any more modern cloche pattern I’ve ever seen. I made my hat from a material that is definitely not period accurate: thick synthetic felt. I cut the pieces without seam allowance and sewed them edge to edge by hand. 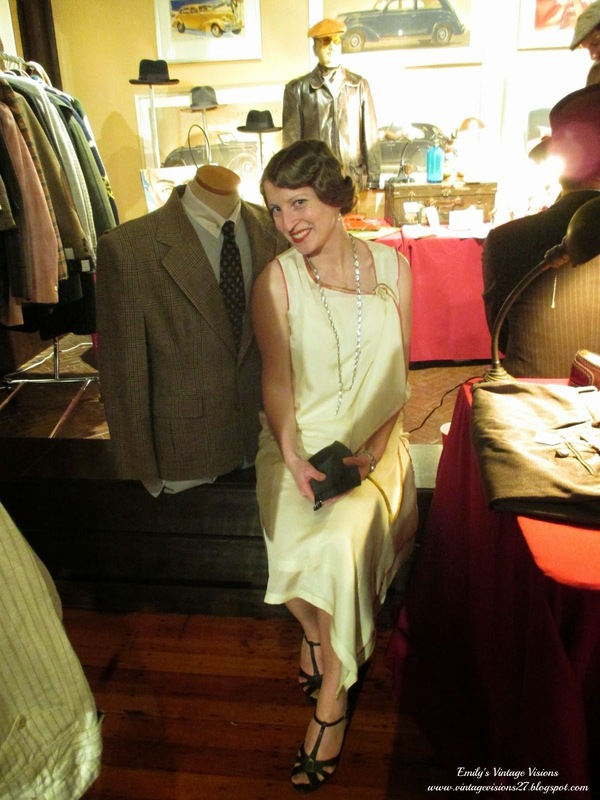 I made a new dress using a 1920s pattern – Vogue 9010 – that I purchased over the winter. I used a lovely ivory silk that I purchased from Deletable Mountain Cloth during their winter sale. The silk struck me as very Art Deco and I really liked the design and feel of it. So light weight. 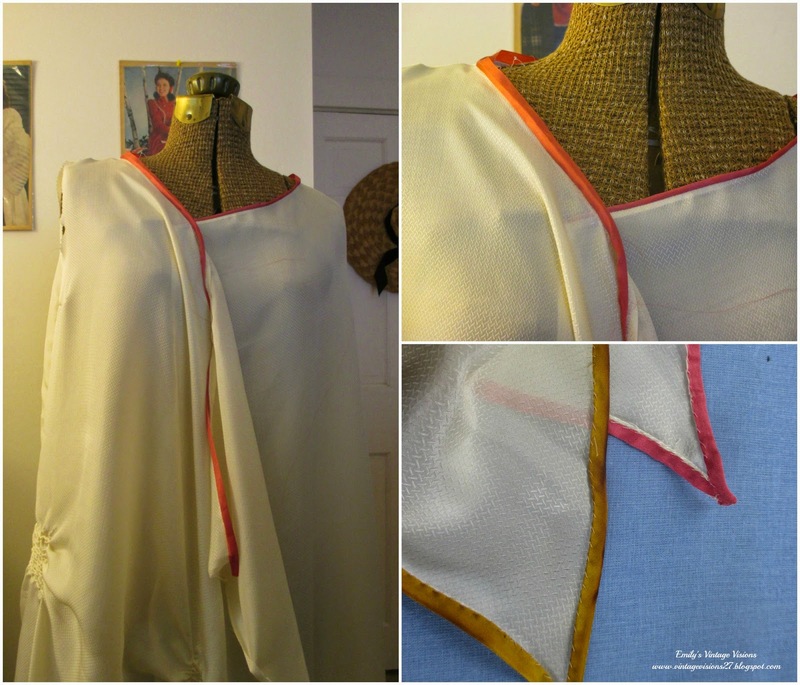 I used a cotton muslin to test the pattern. It looks rather odd because I didn’t have enough fabric to cut the full length of the right front panel. Not really an issue though as this was just a mock up. 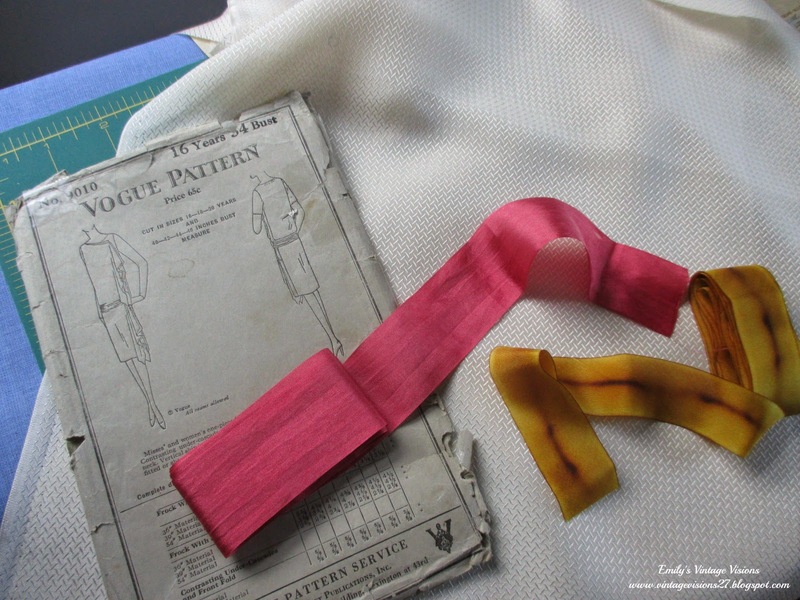 The dress is made from a back panel cut on the fold with little darts at the neck, a left front, a right front, girdle, as well as bodice and skirt cascades. I left the sleeves off . The right front crosses over the left and attaches with a series of snaps on the bodice and hips. The girdle is sewn into one side seam then wraps around the back and attaches at the opposite hip. I added a few extra snaps for good measure. Because my silk was rather delicate I made little cotton patches to go behind the snaps for extra support. The pattern gives you the option of either hemming the edges or trimming off the seam allowance and adding a binding. My original plan was to only use a yellow/gold trim because I wanted to pair the dress with gold shoes. The binding was sewn first to the right side of the silk then folded over and pressed and hand sewn in place. Did you change anything? Left off the sleeves for more of an evening look. Shortened the hem about 1 1/2″. I also added some additional snaps to the waist/hip area and some extra shirring to the girdle. The dress was a little high under the arms so I cut the arm holes a little deeper. Time to complete: ummm, hard to say. I worked on it off and one for about 2 weeks. Notes: Due to the cascades and overall feel of this particular style, this pattern does need to be made with fabric that drapes nicely. One should also avoid fabrics with an obvious right and wrong side. My mock up was made using a cotton muslin which didn’t really hang right. It worked well for determining the overall fit of the pattern however and allowed me to mark up the fabric as needed. If I make this pattern again, which I would like to for day wear, I might try it with crepe and a contrasting cascade. More photos and construction pictures on my blog.